Hutchinson (Penn; M1774) journeyed to London for further medical study, but returned home with the American Revolution underway. As surgeon-general of Pennsylvania he treated soldiers at the Battle of Germantown and inoculated 3,000 soldiers against small pox at Valley Forge. 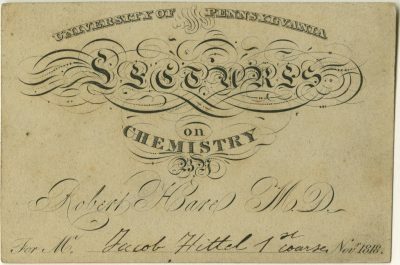 Hutchinson joined the Penn medical faculty as professor of materia medica and chemistry in 1789. He died working to save victims of Philadelphia’s 1793 yellow fever epidemic. While a Penn medical student, Hosack (Penn; M1791) boarded with the family of his favorite teacher, Benjamin Rush (12). He pursued further education in Edinburgh and London where he focused on botany and in time, became one of America’s leading botanists and the creator of Elgin Botanic Garden (now Rockefeller Center). Between his tenures at Columbia University and the College of Physicians and Surgeons, Hosack held the professorship of nearly every medical subject. He attended Alexander Hamilton after his fatal duel with Aaron Burr in 1804. 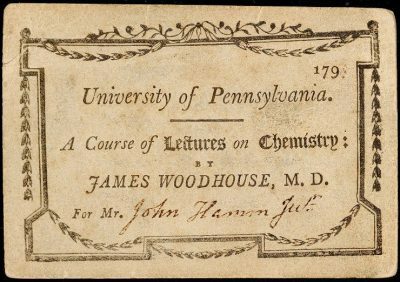 Woodhouse (Penn; M1792) developed a passion for chemistry as a medical student. 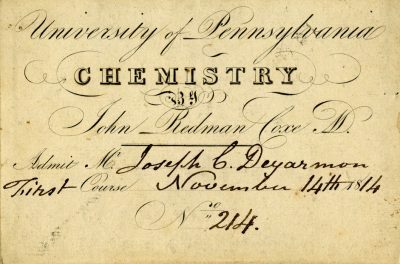 In 1792 he founded the Chemical Society of Philadelphia, an organization he served as president until his death. Woodhouse succeeded Hutchinson (66) as professor of chemistry (1795-1809). He published The Young Chemist’ s Pocket Companion (1797), a book of instructional chemical experiments long before medical reformers called for laboratory instruction in the medical curriculum. 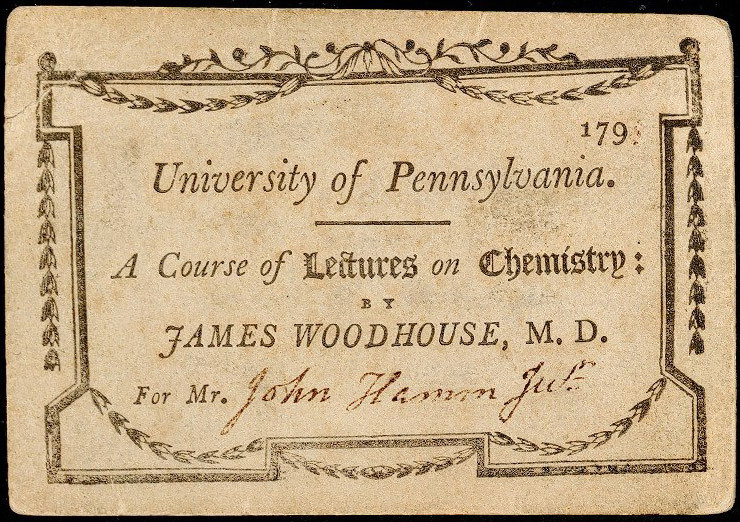 With his experiments on coal, metals and even bread-baking, Woodhouse helped establish chemistry as an industrial, as well as an academic subject. 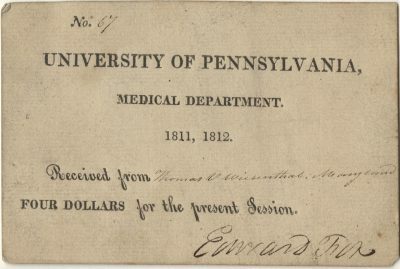 Hamm attended courses in the Medical Department 1796-97, but did not graduate from Penn. He practiced medicine in Dover, Delaware, and Philadelphia before moving to Ohio in 1808. He served as a surgeon and US Army Colonel during the War of 1812. Hamm also led a career in politics as Mayor of Zanesville and a member of the Ohio Senate, and in diplomacy as President Andrew Jackson’s appointed Minister to Chile. University of Pennsylvania Archives & Records Center. Penn Biographies, James Woodhouse (1770-1809). Born in Belgium, Jacobs studied medicine in Austria, served in the Austrian Army, studied in Paris and was drafted into the French Army as assistant surgeon. By the time he sailed for America in 1794, he had a fair amount of formal and practical training. 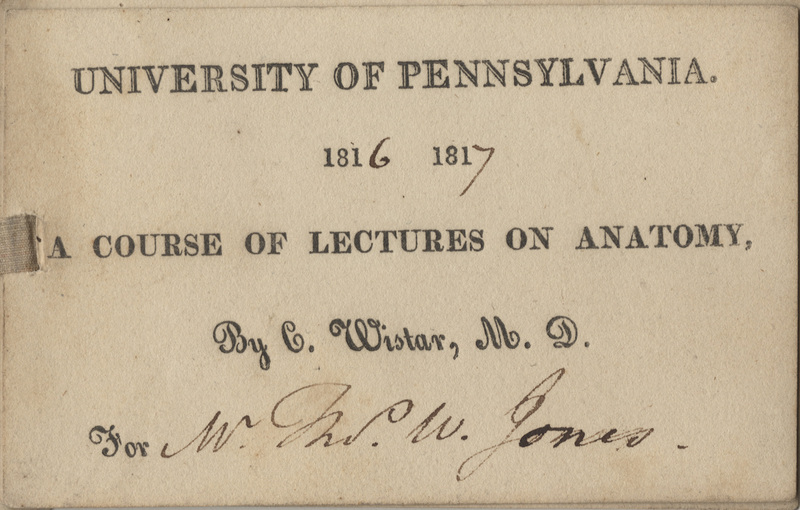 Jacobs entered Penn’s Medical Department in 1798 and soon obtained the position of dissector. 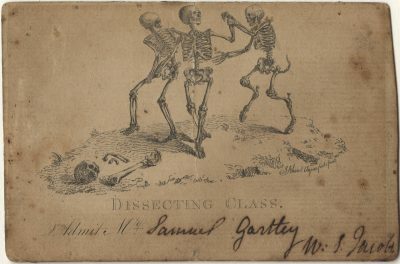 His lecture ticket of dancing cadavers ironically displays the most animated graphic in the collection. Jacobs completed his Penn medical degree in 1801, along with classmate and student Gartley. 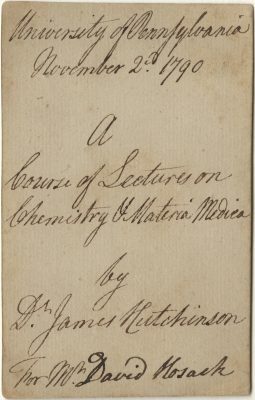 Jacobs published The Student’s Chemical Pocket Companion (1802), a supplement to lectures of Professor of Chemistry James Woodhouse (67). Gartley, who wrote his thesis on a species of hernia called bubonocele, signed on as ship surgeon for a voyage to the East Indies, returning from China in 1803. He settled and established a practice in Norristown, PA, providing consultation to physicians in three counties. During the War of 1812 he was appointed local examiner of soldiers to assess their fitness for service. Auge, Moses. Lives of the Eminent Dead and Biographical Notices of Prominent Living Citizens of Montgomery County, PA. Norristown, PA: 1879. 42-43. Miles, Wyndham. 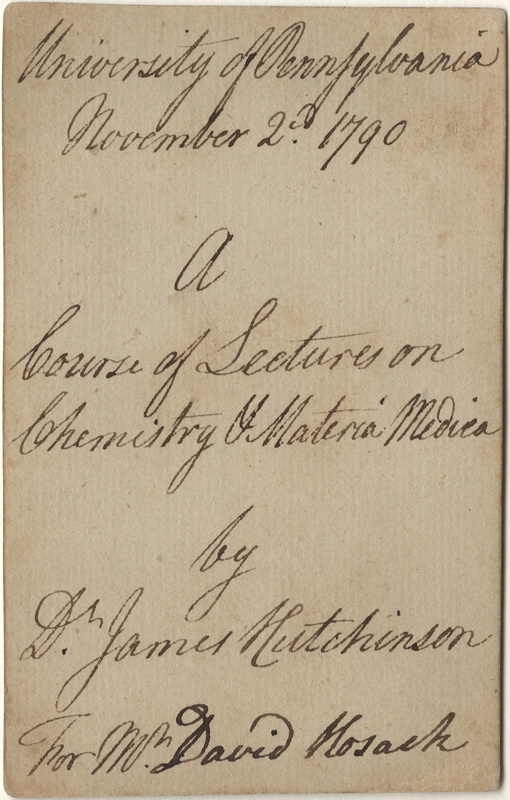 “William Stephen Jacobs.” Journal of Chemical Education. Vol. 24. May 1947. 249. Barton studied with William Shippen, Jr. MD (10) and attended, but did not graduate from the University of Edinburgh. In 1796, seven years after joining the Penn faculty as professor of natural history and botany, Barton received an honorary medical degree by Christian-Albrechts University at Kiel, Germany. 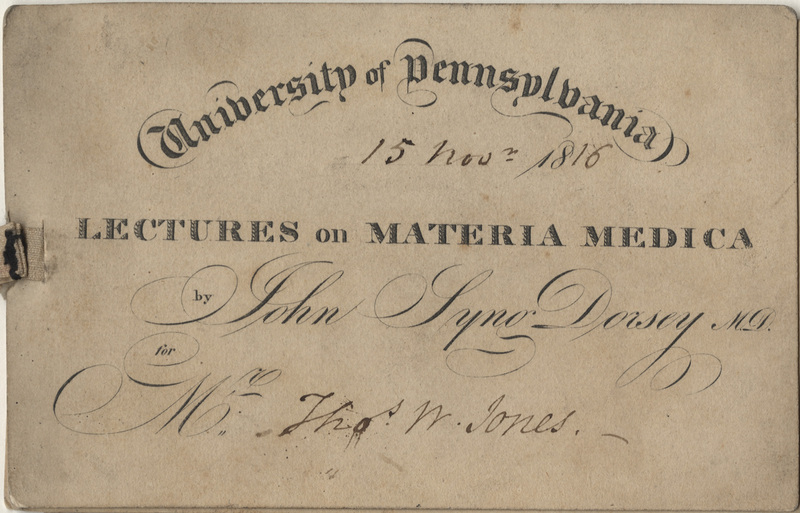 At that time, Penn added the professorship of materia medica to his post in the Medical Department, and in 1813 appointed him professor of practice of medicine. 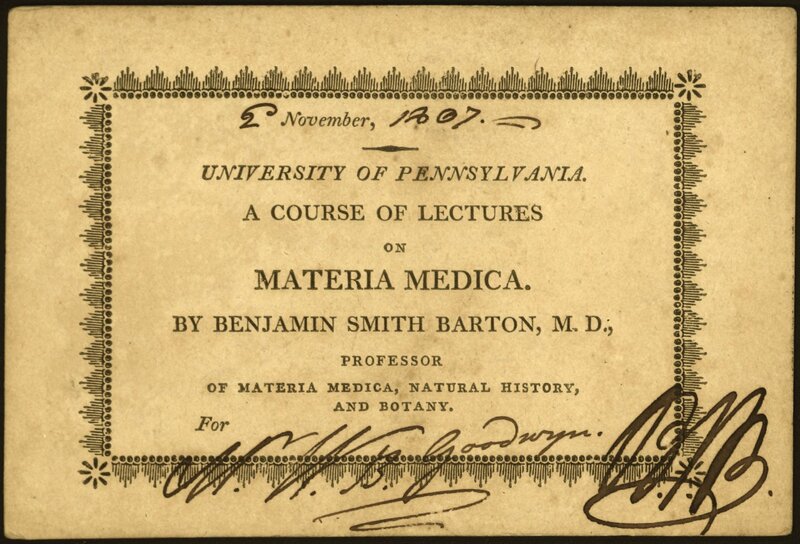 Barton led a prolific career authoring books on natural history, botany, paleontology, etymology and medicine. He wrote the first American text on botany and served as an advisor to the Lewis and Clark Expedition. 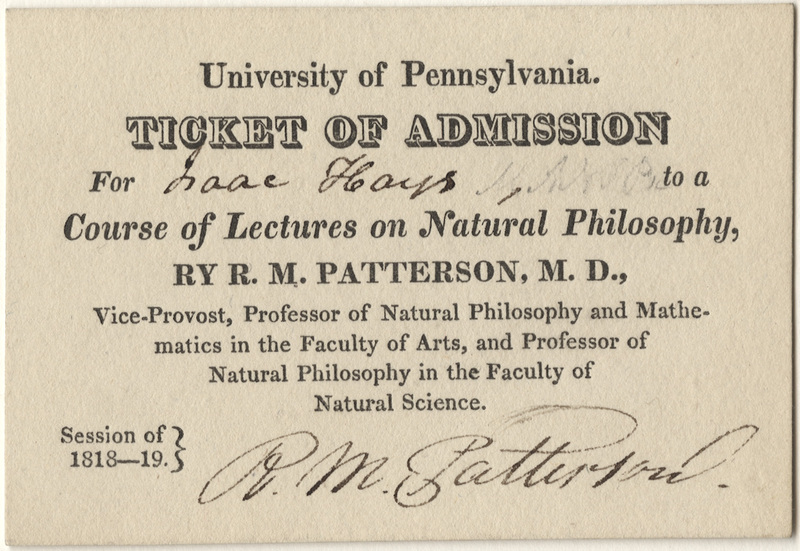 Goodwyne (Penn; M1809) of Virginia wrote his graduating essay on “Exercise as a Remedy.” While a student of Barton’s course in natural history, Goodwyne subscribed to a membership in Peale’s Museum (42). Barton and Charles W. Peale had a longstanding collegial relationship from their association with the American Philosophical Society and shared interests in natural history. University of Pennsylvania Archives & Records Center. Penn Biographies, Benjamin Smith Barton (1766-1815). 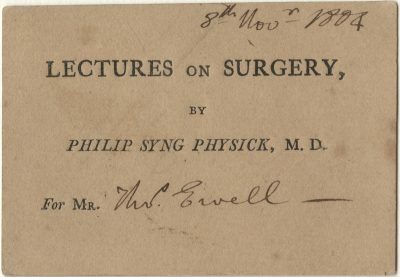 This lecture ticket reflects a milestone in the recognition of obstetrics as an independent specialty, no longer attached to the professorship of anatomy. 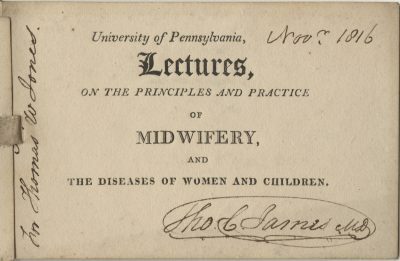 Just one year before James issued this ticket, Penn appointed him the first professor of midwifery (although medical students were not required to take the course until 1813). 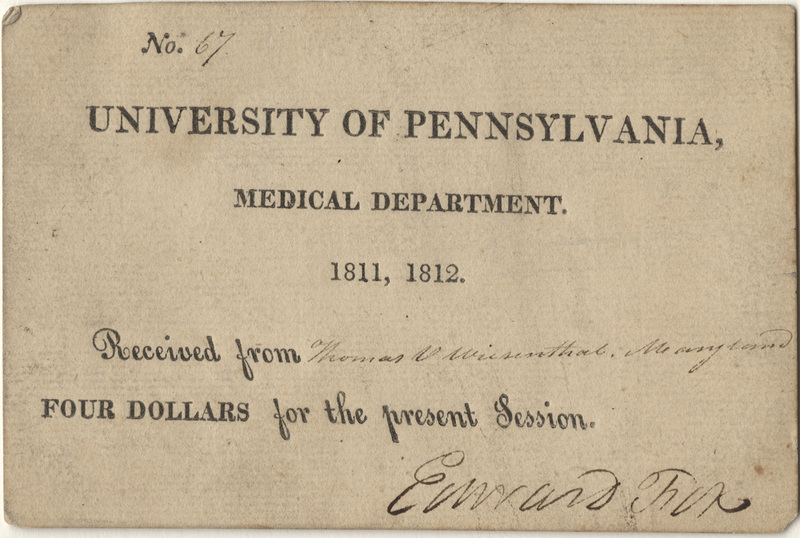 James had received his bachelor’s in medicine from Penn in 1787, but for financial reasons, could not complete the medical degree until 1811 — after receiving his faculty appointment. 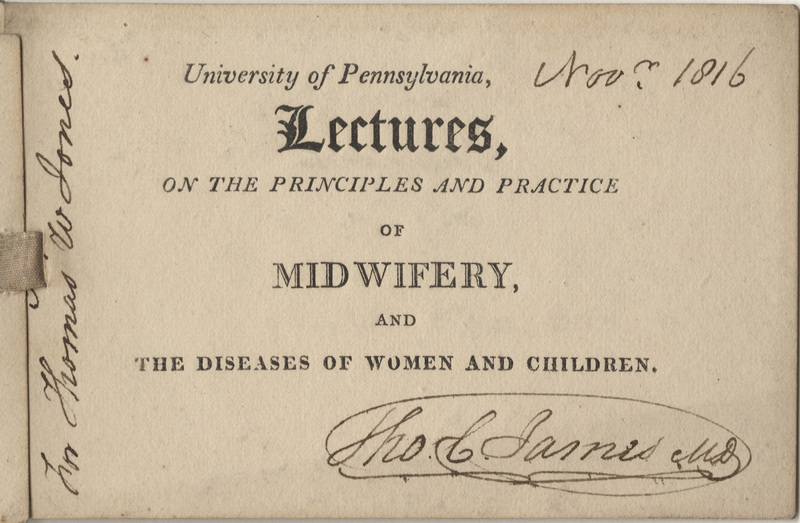 A pioneer in the teaching of obstetrics in America, he lectured on the subject at the Philadelphia Almshouse (3) beginning in 1802. 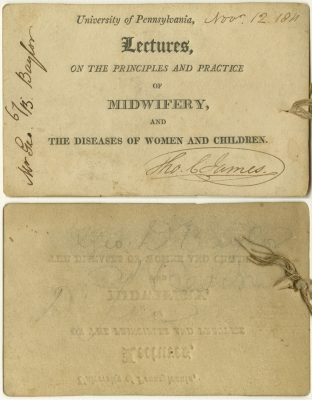 James built a successful private practice that focused on obstetrics and served as physician (1807) and obstetric physician (1810) to Pennsylvania Hospital. He was the first American physician to induce labor with a successful outcome for mother and child (1810). Baylor of Newmarket, Caroline County, Virginia, did not graduate from Penn, but practiced medicine in Virginia. Kelly, Howard A. and Walter L. Burrage. American Medical Biographies. Baltimore: The Norman Remington Company, 1920. 607-608. University of Pennsylvania Archives & Records Center. Penn Biographies, Thomas C. (Thomas Chalkley) James (1766-1835). Wiesenthal was the third generation of medical men in his family. His grandfather had started a private medical school in Baltimore in the 18th century and his father was an anatomist. Wiesenthal’s four-dollar payment represents his matriculation fee for the year’s course. This was in addition to any lecture fees he paid directly to the professors. Wiesenthal did not complete his medical degree at the University. However, he did serve as surgeon’s mate on the Frigate Java during the War of 1812 and received an honorary medical degree from the Medical Society of Maryland in 1822. Wiesenthal was also a composer of 19th-century American popular songs. Finson, Jon W. The Voices that Are Gone: Themes in Nineteenth-Century American Popular Song. NY: Oxford University Press, 1994. 17. Kelly, Howard A. and Walter L. Burrage. American Medical Biographies. Baltimore: The Norman Remington Company, 1920. 1232. Quinan, John Russel, MD. 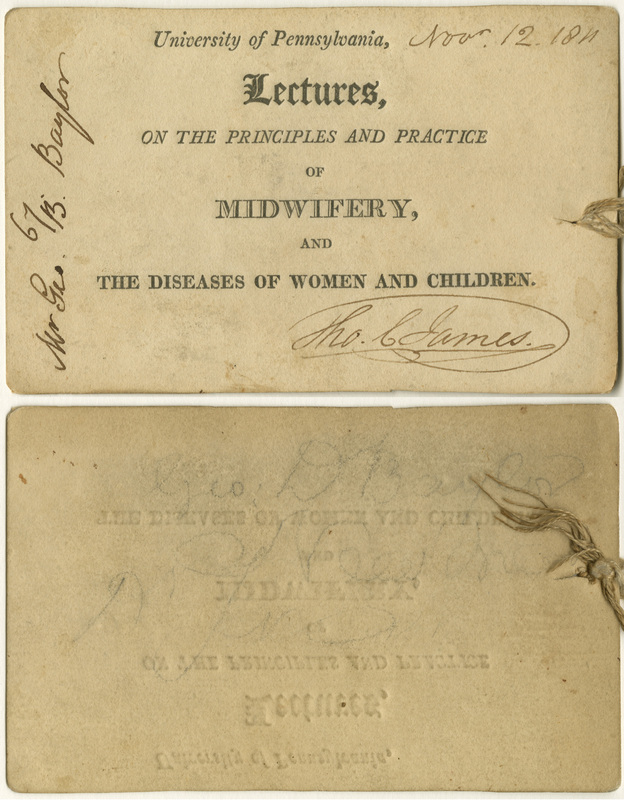 Medical Annals of Baltimore from 1608 to 1880, Including Events, Men, and Literature. Baltimore: Press of Isaac Friedenwald, 1884. 178. Chapman (Penn; M1801) pursued advanced study in London and Edinburgh. 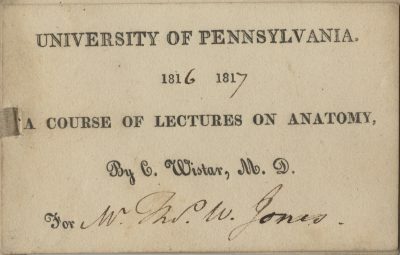 He returned to Philadelphia in 1804, started a medical practice, taught private classes on midwifery and in 1807 joined James (70) in lecturing on midwifery, presumably at Pennsylvania Hospital by then. 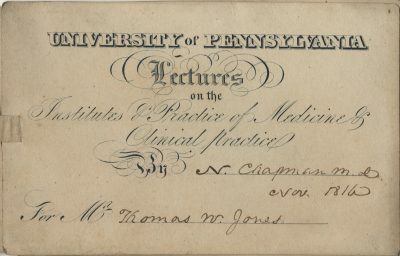 In 1810 Penn made James the University’s first professor of midwifery; Chapman again assisted him and in 1813 received his own chair, materia medica, and from 1815 to 1850, theory and practice of medicine. 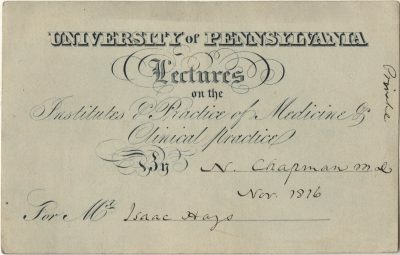 In 1817 Chapman founded the Philadelphia Medical Institute (36), where he lectured for about 20 summers, and what became known as The American Journal of the Medical Sciences. In 1847 the American Medical Association elected Chapman its first president. 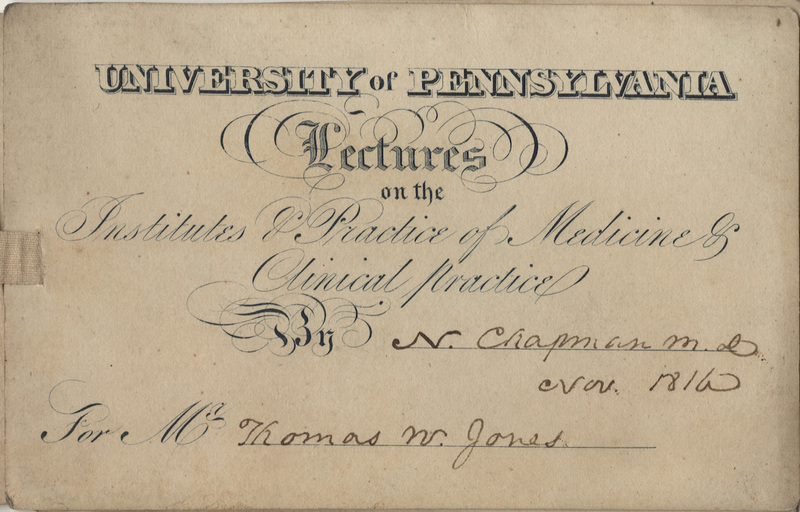 His pupil and preceptee Hays (Penn; M1820) became a pioneer in American ophthalmology. He published numerous articles on ophthalmology and authored the chapter “Diseases of the Eye” in the 1833 textbook, Practice of Medicine. Hays, one of the original staff of surgeons at the Wills Hospital (1834), published the first study on noncongenital color blindness, reported the first case of astigmatism in America, and developed a needle-knife for cataract extraction. 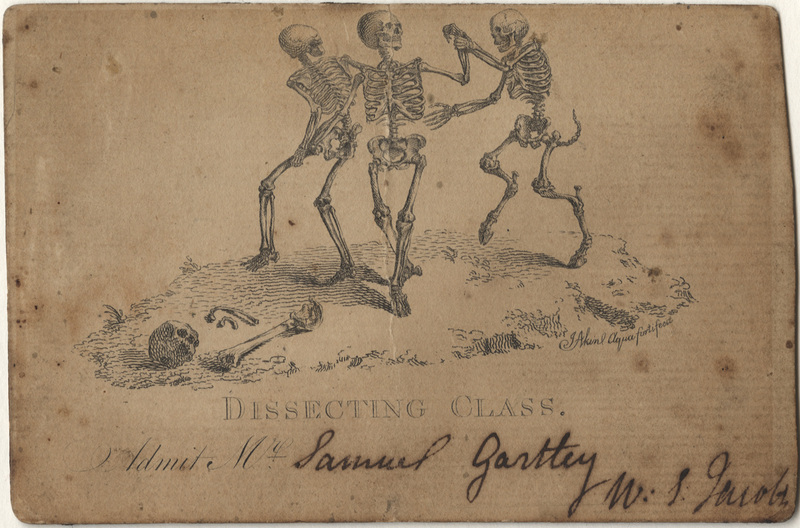 Gross, Samuel D. Lives of Eminent American Physicians and Surgeons of the Nineteenth Century. Philadelphia: Lindsay & Blakiston, 1861. 663-677. Morgenstern, Leon, MD. 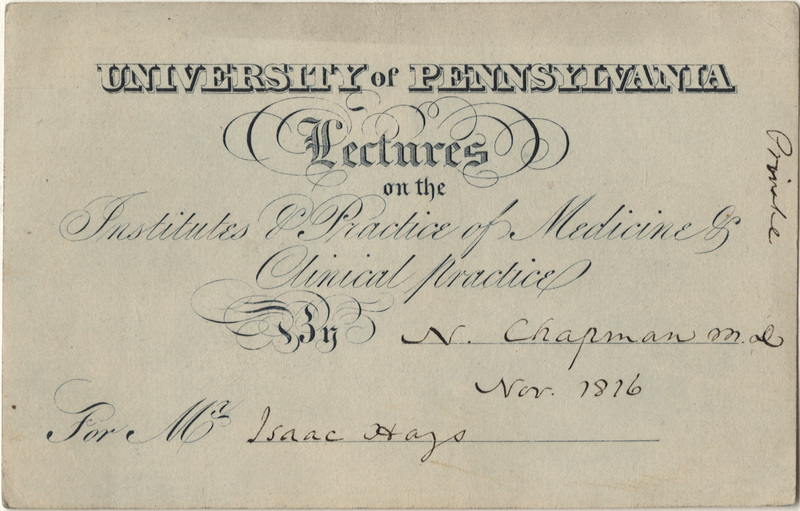 Isaac Hays, MD: Nineteenth-Century Pioneer in Ophthalmology. Arch. Ophthalmol. 2004;122(3):385-387. Alabama Pioneers: The Alabama Genealogy Resource!. Charles P. Jones, Montgomery, Alabama. 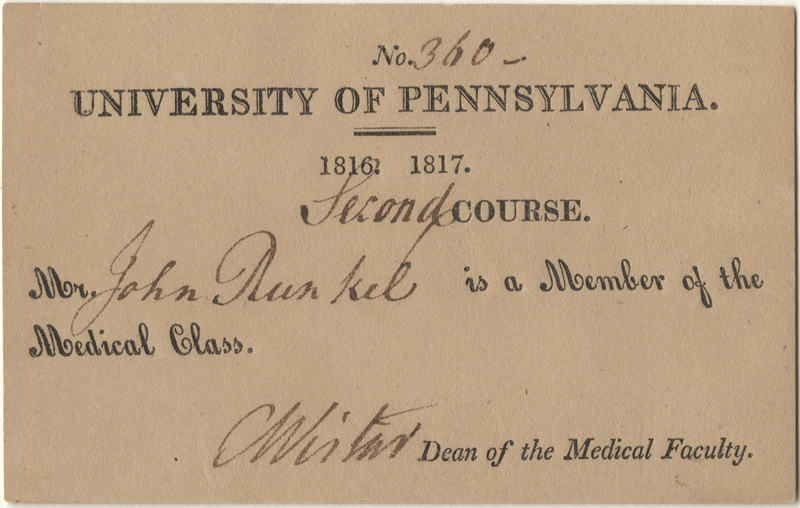 Dean Wistar (13) signed this matriculation ticket for the “Second Course” of a two-year medical program. The second course was identical to the first, and first and second-year medical students sat side by side in these courses. Later reforms in medical education introduced a graded system in which students took a logical progression of courses, beginning with basic sciences and building toward clinical sciences. 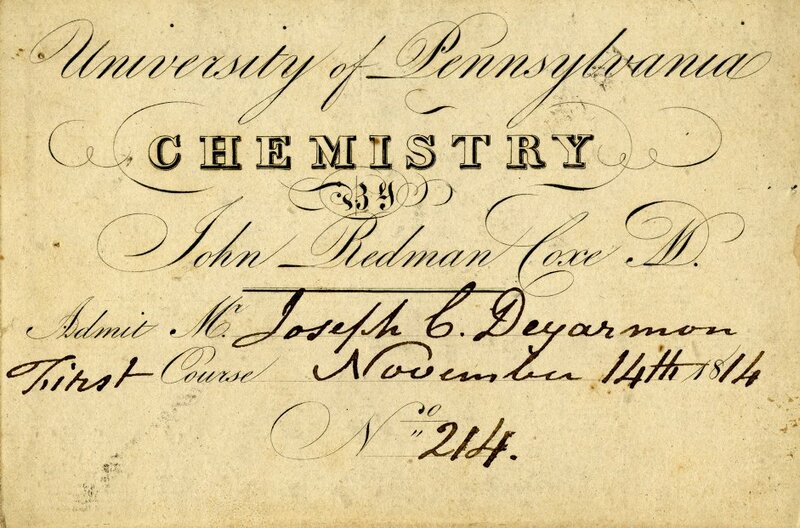 At Penn, the graded system began in 1877. As the son of a pastor in the German Reformed Church, Runkel assisted his father in his churches in Germantown (Philadelphia) and New York City, and started studying for the ministry. He had a change of heart and instead pursued a medical education. 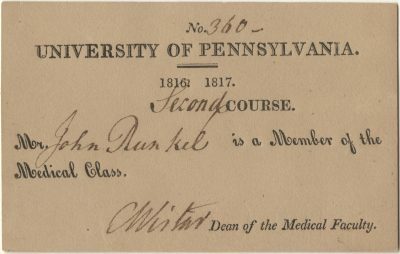 Runkel attended classes at Penn in 1816-17, but did not receive a medical degree from the University. He briefly practiced medicine in Maryland, but in 1821 joined his father’s family in Gettysburg. According to his biographer, Runkel, “being possessed of means,” did not actively pursue a medical career. Harbaugh, Henry and Daniel Yost Heisler. The Fathers of the German Reformed Church in Europe and America. Vol. 2. Lancaster: J.M. Westhaeffer, 1872. 304-05. History of Cumberland and Adams Counties, Pennsylvania. Chicago: Warner, Beers & Co., 1886. 368. Hare, the son of a successful brewer, adapted a keg from his father’s brewery to develop the hydrostatic blow-pipe – or oxyhydrogen blowtorch — before age 20. 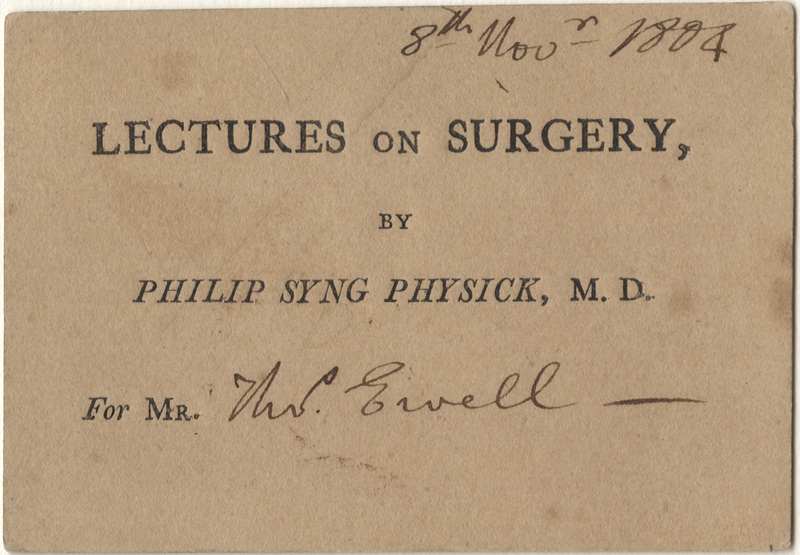 The invention contributed to his honorary medical degree from Yale University in 1806. 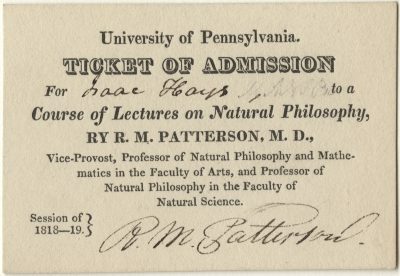 The year of this lecture ticket marked the first of Hare’s 30 years as Penn’s chair of chemistry. He was known for dramatic demonstrations in the lecture hall and important inventions including the calorimeter, the deflagrator, the litrameter, a hydrostatic balance and others. By isolating boron and silicon, he became the first American to produce metallic calcium. 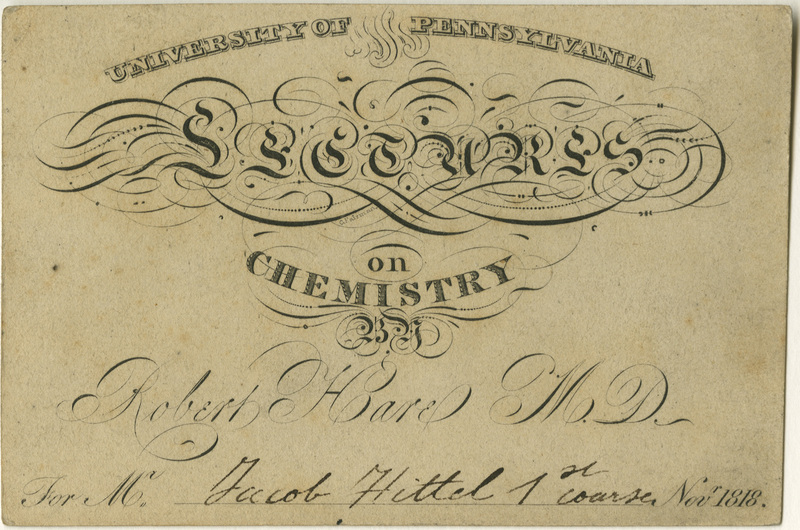 Hittel (Penn; M1821), who grew up speaking Pennsylvania German, learned English at age 16 and apprenticed with two physicians in Quakerstown, PA, before enrolling in Penn’s Medical Department. He practiced for five years in Lancaster County and in 1832 relocated his family and practice to Butler County, Ohio. Hittel was one of several petitioners lobbying for reforms at the Medical College of Ohio (35). Drake, Daniel, editor. The Western Journal of the Medical and Physical Sciences. Vol. 9. Cincinnati: N.S. Johnson, 1836. 170-71. “In Memoriam: Theodore Henry Hittell.” Proceedings of the California Academy of Sciences. Fourth Series. Vol. VIII, No. 1. June 17, 1918. 3-5. Corner, George W. Two Centuries of Medicine: A History of the School of Medicine, University of Pennsylvania. Phila: J.B. Lippincott Company, 1965. 72.